If you walk into any retailer at the mall, you’ll find that almost all of them follow similar techniques when it comes to catching a shoppers eye, drawing them in and selling to them. Of course you don’t want to follow exactly what large retailers are doing because you’re a small, independent, handmade business and much cooler than them! But you can learn about some of the tried and true strategies they’ve perfected over the years, take what you like and apply it to your business. Retailer’s best practice: they use this area to tell a story at a quick glance. Retailers know they only have a few short seconds to grab the shopper’s attention and intrigue them enough to head in. A good window display is simple and clean while using a variety of elements to lead the eye around the window from one item to the next. 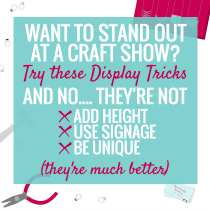 How you can use it at a craft show: since shoppers can see your full booth at a glance, treat your entire space as that window. Remember your signage, so shoppers can immediately identify who you are, and that eye-catching elements need to be slightly higher than eye-level so shoppers notice you from across the venue or above the crowds. You only have a few short sections to grab their attention so consider that when planning. Include elements such as color, lighting, line & composition, scale, contrast, repetition, humor, nostalgia, movement or an element of surprise (these ideas will be explained further with examples in next week’s article). Be sure not to go overboard though; the eye needs a rest and change of pace so your display doesn’t start to blend together. Lighting to highlight a few displays is great; using spotlights on every element of your booth will be too much. Retailer’s best practice: this is the front table or display area that the shopper will see first when they enter the store and that houses the products the retailer wants to draw attention to; it may even house the pieces the shopper just viewed in the window. Retailers often also treat this as a decompression zone where they allow shoppers to adjust to their settings without being sold to by sales associates. Zone 1 should be eye-catching, relevant and updated frequently to keep it fresh and full since items placed here usually sell fast. 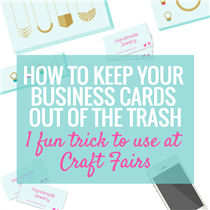 How you can use it at a craft show: which area of your booth will shoppers see first? If you’re attending a large trade show and have reserved a big space, you may have the room to dedicate an entire front table to your Zone 1. If your booth allows shoppers to walk into your space but displays are kept along the wall, or you have one large table for people to shop from, consider which part your shoppers will see first. It may be the start of your space or the opposite end of your table catches their eye first. Wherever that is for you, create an eye-catching display here full of your best sellers. Although you don’t have as much space or time as retailers for decompression, you should still have a small grace period where you allow shoppers to take in your products before you start to sell. Give a smile or “hi” when they first arrive to acknowledge them and then let them peruse a bit before you start your sales pitches. You’ll know what’s best for your space and your shoppers. If a conversation starts as soon as they walk up; go with it! If they seem a little standoffish, give them their space. Retailer’s best practice: there is often a morning meeting each retailer has before they open their doors. A little pow-wow with the staff working that day to go over what’s new, sales goals, individual’s responsibilities and to get everyone motivated for their shift. There will often be a specific goal each sales person is responsible to reach and there may even be a specific item the retailer wants him or her to focus on selling that day. 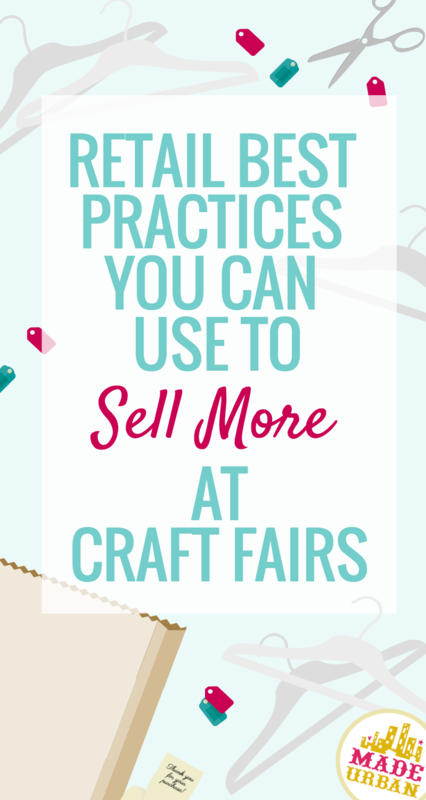 How you can use it at a craft show: although “selling” can feel inauthentic to many of us, it’s something we do need to focus on to make a profitable business. Setting a sales goal for the day can help keep you on track, push you to get outside your comfort zone and encourage you to start telling shoppers what makes your products so great. 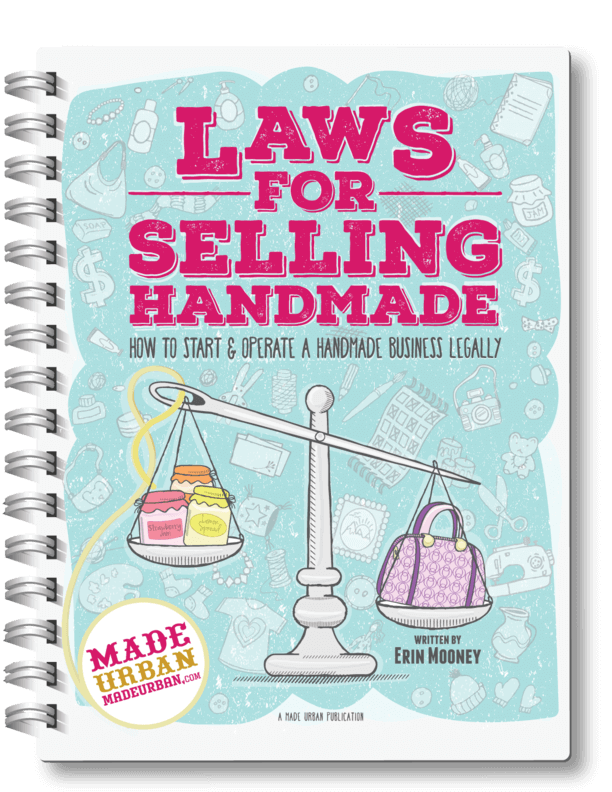 You want to walk away from that craft show with more cash in your pockets than you came with so before those doors open, determine how much you need to sell to cover your costs of the event and to make a profit (use our handy formula here). On top of that, you may find it helpful to have a particular product to promote. Is there an item you have a lot of stock in or are really hoping to get the word out about? Determine why shoppers might care about that item and how you can work that into a sales pitch. Once people are sold on it, you can use the next step to bring attention to some of your other products. Retailer’s best practice: think of the items you see at the check-out of your grocery store; candy bars, gum, gossip magazines. These most likely aren’t the items you came to purchase but while you’re standing in line, you have a minute to look over these products and might impulsively add them to your cart (since they have a lower price point). These items may also be accessories that improve the product they’re selling. For example: at shoes stores, they often display or suggest a spray protector or cleaner to keep your shoes lookin fresh. Toy stores may display batteries you’ll need for that toy. Clothing stores may display jewelry that would be a lovely addition to compliment the outfit you’re buying. How you can use it at a craft show: first consider which products will be your meat and potatoes and which items will be your sides. For example: if you’re selling handmade mittens, microwavable pocket warmers may be a good side product. What about change purses that match the handbags you’re selling? What compliments your products or helps improve them? These will be your cross-selling items. Now determine where your customers will stand as you’re completing their transaction. Even in a small space you should have a dedicated area to direct customers to purchase…even if that’s just at the other end of the table. 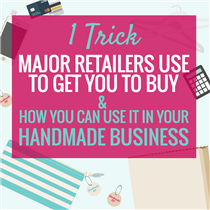 This guides people out of your Zone 1 so you’re still attracting shoppers while you conduct a sale. As well, it’s a great spot to display your cross-selling, lower priced or sale items that aren’t the main focus of your booth but that make a good addition to any purchase. A word of warning; be sure that you’re not “pushing” additional products onto your customers. You can easily break their trust and spoil their experience if they feel like you’re trying to squeeze extra dollars out of them. Tell us in the comments below which technique you’ve found most effective at craft shows! Well, besides bringing work in various price points, I figure out my most lucrative work and give those items the best spot in my display. I even display them in a gift box. I subtly push these items and bring lots of back stock so that I have plenty throughout the whole show to the very end. People often rush in at the end for more and are delighted when they get it.